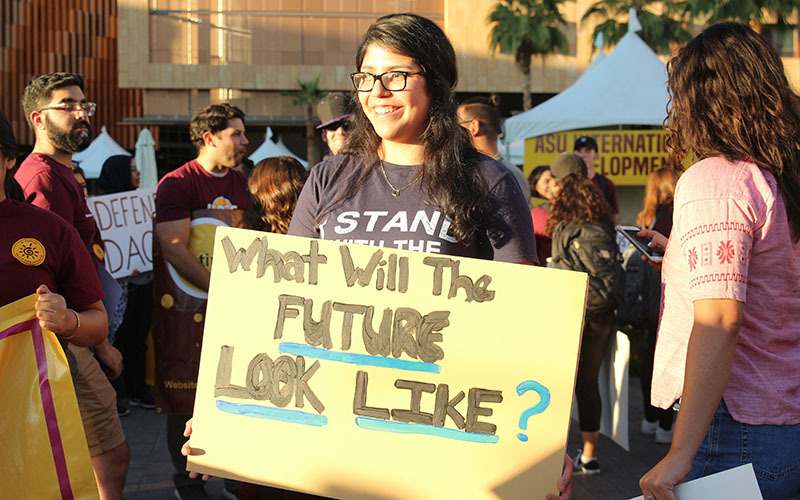 TEMPE – Last Thursday, the student organization Undocumented Students for Education Equity lead a march in support of DACA students. Dozens of students marched through Arizona State University’s main campus, chanting and holding signs. The march was not only a show of support for DACA students but a protest against Arizona Attorney General Mark Brnovich. Three days after President Donald Trump decided to rescind DACA, Brnovich sued the Arizona Board of Regents for offering in-state tuition to DACA students. Brnovich cited Proposition 300 as the basis for the lawsuit, which says in-state tuition only applies to students with lawful immigration status. 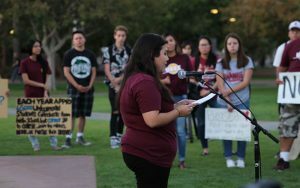 Belén Sisa, a student, DACA recipient and member of USEE, led the group from University Bridge to Hayden Lawn. They were ready. The crowd followed Sisa across the bridge. They paused for a moment, unfurling a USEE banner over the edge. They waved their signs at passerby. They walked down a palm tree-lined path to Hayden Lawn, chanting all the way. ASU police shadowed the march, riding bicycles a few feet behind. Students looked up from their coffee cups and textbooks. Some took out their phones, capturing a few seconds of the protest. 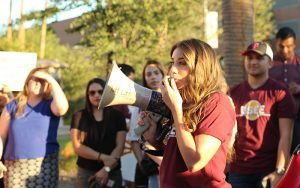 On Hayden Lawn, Korina Iribe stepped up to a microphone. She told the gathered crowd how it had taken her nine years to earn her undergraduate degree because without in-state tuition, she could only afford to take a class or two at a time. It was only with in-state tuition that she was able to finish her degree, she said. Now, she is enrolled in a graduate program, she said, as the crowd clapped for her. Iribe laughed and said she hoped it wouldn’t take her nine years to earn that degree. Iribe’s mother brought her and her siblings to the United States from Mexico when Iribe was a child. They were escaping a “domestically violent situation,” she said, but they didn’t realize what challenges they would face as undocumented people in the United States. Another DACA student talked about her own mother. Nearly two months after U.S. Attorney General Jeff Sessions announced Trump’s decision to end DACA, the issue has largely left the news cycle, for now, making way for other stories. The march was a way to keep it alive, the students said, and remind people that for DACA students, there is still no definitive answer about their future. The students took turns at the microphone, sharing the stories of their family’s journeys to the U.S. and their worries about the future of DACA and the outcome of Brnovich’s lawsuit. One DACA recipient spoke about watching her older brother grow depressed without the possibility of college in the pre-DACA days. Another said she knew that, as a DACA recipient, she wasn’t eligible to vote but she could still use her voice to influence people who can. Angelica Romero listened, nodding along as the students told their stories. Romero isn’t a DACA recipient, but her older sister is. After turns were taken at the microphone, Iribe returned to speak. She read from the “Sun Devil Constitution” which members of USEE wrote. “All students are equal, regardless of skin color, nationality, gender, immigration status or appearance,” Iribe read. At the end of the evening, each attendee signed their names underneath the “Sun Devil Constitution,” affirming their support for equality for the student body. Vasthy Lamadrid, a DACA recipient, added her name and smiled as others did the same.